This entry was posted on December 21, 2009 at 4:35 pm. You can follow any responses to this entry through the RSS 2.0 feed. Both comments and pings are currently closed. 7 Responses to "Carping on, not gobbling away at Christmas"
Crikey, did you take a bath in that water before you put the fish in or something? 🙂 Will they survive in there till Friday? I’m sure this post will be weird in Czech within the next 10 years or so! bloody hope not… Christmas celebrated on 24th here… If the’re alive on Friday it means I’m not! 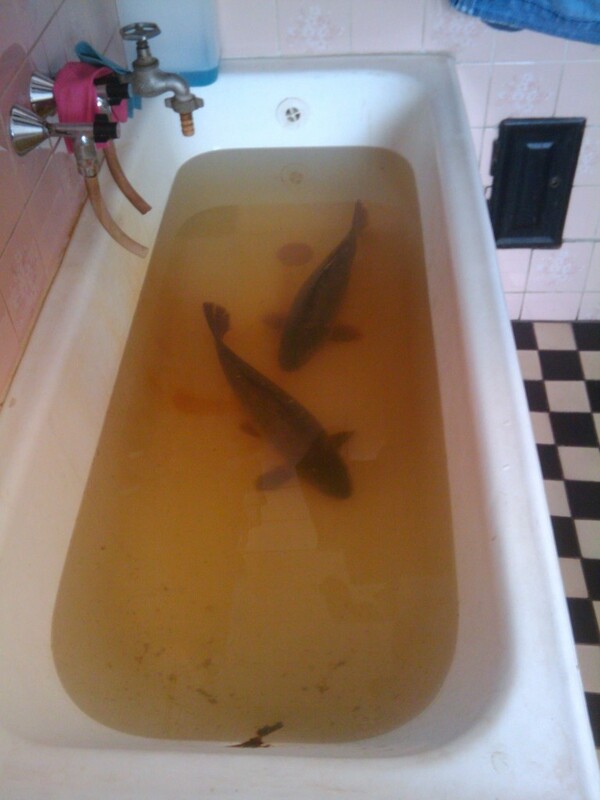 and no the muck in the water is from the fish, that’s why they are bought early and left in the bath, to purge the nasties! Think yourself lucky Sally… Tesco have GARUNTEED the lowest priced Carp in Cz stores… so your counter-parts (get it hehehe) over here are going to be bloody busy slaughtering and filleting Carp! They tend to be kept in tanks in the car parks (where it drops to minus10) here though not on the fish counters inside the stores. Agree with your Dad I well remember that Christmas not much chicken and not many presents come to that. The following year we went to Auntie Millie’s for Christmas and had turkey for the first time.